Islamic­ influenced art and imagery has cropped up in games from Journey to Prince of Persia, but now a couple of game developers are out to prove that despite its conspicuous rarity in the medium, Islamic art lends itself brilliantly to game design. Islamic art can be subject to restrictions that should hobble most video games. Under Islam’s strictest tenets it must be aniconic, so any depiction of nature – humans, animals, trees, etc. – is considered a sin against God. As a result its artwork traditionally took the form of attractive shapes, intricate patterns, and complex geometry designed to inspire the human mind. Todd’s Music of the Spheres is a laid back puzzle game that asks you to make sense of complex patterns via simple shooting and rhythm mechanics. While its puzzles can leave you scratching your head, they are designed for contemplation rather than frustration. This is informed by the nature of Islamic art. Todd is now working with Bahrami to make Engare. The game was inspired by a geometry question once put to Bahrami’s high school class, which made even the mathematically indifferent strive after the solution. The games industry in the Middle East is growing rapidly. In 2012 Iran alone boasted more than 95 active studios. Yet we still see very few games explicitly influenced by this culture. There are a number of reasons for this; if we take Iran as an example, the stressful political climate in the country can make it difficult for developers to reflect what is going on around them due to the danger of agitating the government. Although more people than ever have access to the resources necessary to make a game, publishing remains a huge obstacle. It’s not only a risk; trade sanctions keep major western publishers out. Some Western-developed games have caused controversy by, often inadvertently, featuring Islamic elements. In 2008 Sony had to delay the release of LittleBigPlanet so that a song featuring lines of the Qur’an could be removed. In 2012, a Call of Duty: Modern Warfare 2 map was taken down and altered to remove a quote from Muslim prophet Muhammad that featured on a painting in a bathroom. Outside of Islam, the Church of England threatened Sony with legal action in 2007 over the use of Manchester Cathedral as a setting in Resistance: Fall of Man. While these controversies were relatively small and were each swiftly resolved, religion as a hot-button issue may cause Western developers to view them as cautionary tales. Even a fairly low­key release like Music of the Spheres quickly attracted derogatory comments about Islam and 9/11 on its Steam Greenlight page. This is, of course, only considering the influence of Islamic art in video games in the most literal sense. While the physical art itself is geometry or architecture, the spirit of this work can reach much further, and might offer guidance for one of the more significant problems faced by the games industry today. “The problem people have been thinking about for a while is, how do we make video games that can move you towards deeper considerations?” says Todd. “Islamic art has a sense of trying to inspire you to think about higher things. There are very few games that you could describe as sublime. This is exactly the intention of Islamic art. It’s necessary here to draw a distinction between the aesthetic of Islamic art and its spirit. The Prince of Persia games are one of the few ‘major’ titles to prominently feature Islamic art in the form of temples and decorative artwork, but its focus on combat and acrobatics means you’re unlikely to say it embodies the spirit of contemplation and deep thinking. Music of the Spheres on the other hand uses the aesthetics to evoke this spirit through the ponderance and surprises of its puzzles. Perhaps a better-known example is Journey. 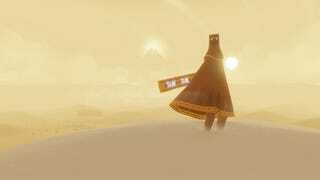 It features a character in an outfit similar to a Muslim hijab, architecture inspired by temples and mosques, and shades of patterns and geometry in the abstract diagrams that offer glimpses of the game’s backstory. It uses these, and other aspects of its game design, to invite you to think on topics such as life, death, and the afterlife. The rules of this ancient art form have been subject to reinterpretation for centuries. At a stretch this spirit could be taken as a metaphor for game design: code and maths, patterns and shapes coming together to offer far more than the sum of those parts.